Check out my NEW Winter Solve & Check Math Worksheets for 4th grade. This pack contains 33 math worksheets aligned to the 4th grade CCLS for math. Students solve each problem and then color the answer below. This self-checking feature works out great for homework, independent or partner practice, morning work, or centers. Students immediately know if their answer is correct. If they are not able to color in the answer below they know to try the problem again. I like to bundle a couple of the worksheets together and send them home for extra credit over February break. That way students stay fresh with their math skills as they review previously learned concepts. Download the preview on Teachers Pay Teachers for 2 FREE Color & Solve fraction worksheets. 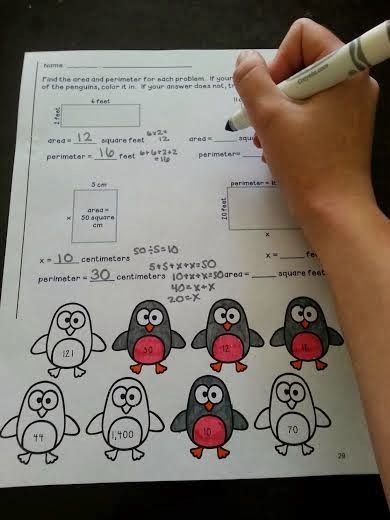 Enter to win a FREE pack of my Winter Math Solve & Check Math Worksheets below. How will you use these worksheets in your classroom? I would use them during independent seat work during math rotations. I'd use them while I am working with small groups. I would use them for independent work - we always need much more practice with fractions. I would use them for independent work during math and math intervention time to help reinforce the material to my urban students. These look great. I would use them for morning work or homework. Thanks for the opportunity. These would be amazing for an independent math station or seat work while my other students are working on computers. Thanks so much for the freebies! This would be wonderful for an exit ticket or warm up during the day!